Smiling softly, Shadow Flame looked at Evony, as he learned she was called, and nodded. She seemed to be very perceptive, he noticed. Her eyes seemed to take in everything, and not miss anything. "That is correct. The stars is the answer. Would you like to try a riddle of your own? If not, someone else can go in your stead." Deciding to shift once more, Shadow Flame shifted to his Spring pixie form, flitting his wings and sitting on the fruit of a nearby tree, swinging his feet a bit with a grin. A ghost of a smile lifted the corners of Evony's mouth, discernable only if one was watching closely. She could see this Shadow Flame understood, and it was no big deal. That made her more comfortable than almost anything else. The deliberateness helped, but it also made her suspicious. She sighed softly and blinked to clear her head. Uncertainly, reluctantly, from her back pocket she took out a very thin notepad that was worn smooth from use. She opened it carefully to a blank page, and folded inside was a small wooden stick with the end burned black. Lightly she scrawled her words, brows firrowed, eyes flickering upward and around the group often. This paper she passed around to her new company, hoping they wouldn't take offense. There were those who thought it was terribly rude of her, or else just plain not worth the trouble. Evony startled at Shadow FLame's abrupt shift and movement. She froze and watched, keeping a close eye on him. She couldn't suppress the tiny sparkle in her eye, however, as she watched him swinging his tiny legs to anf fro like she had as a child once upon a time. "The river," Songhue murmured with a faint grin. "'Tis the river, sure as the grass does bow to the wind. Now for my own.. But it has no eyes to see where it lingers." Such a strange girl, this quiet Envoy. Unless she was mistaken, Songhue thought she saw the stranger's hands shake a bit as she passed the well-used note book around. Shifting herself, a subtle shimmering of air precluding the emergence of a kitsune where she had been but a moment ago, she curled up with her feet tucked under her and all nine tails wrapped tight. Slowly she was starting to relax again, the tips of her fangs showing in a faint smile. Her eyes, however, remained wary, aged and cautious. Like so many others, there was a great and hidden story to this girl. OOC| Urrrg! a thousand apologies for taking so long to reply! BIC| Vineda yawned and stretched slowly, disspelling the tension she'd felt building as wariness had crept over the group. She too scolded herself with a small shake of her head. She was here with friends, and she really had no reason to worry. A warm smile stayed on her lips; it was so good to have this place and friends such as these. She got up and walked into the trees, returning a short time later with a skirt full of apples and some berries. She sat and offered her treats before speaking, building a small pile in the center of their group. "Anyone want a snack? I believe you speak of trees, my friend." She fiddled with the apple she'd chosen for herself, then chuckled quietly. It seemed her bonded was rubbing off on her. He could never sit still, and now more and more often she found herself fidgiting as well. Pull me back and watch me soar. Can anyone tell me what this is?" After looking at her apple broodingly, Vineda crossed her legs indian-style and began munching on her apple. "Arrows," came the quiet answer, the kitsune's eyes flashing as a shiver ran down her spine. There were a few unpleasant memories involving these creations.. Poisoned tips and exploding heads not the least of them. You can not catch a bowl-full." 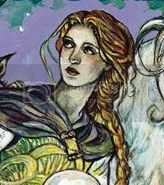 She watched, eyes ever wide and watchful, as the Songhue fae answered the riddle. Apparently unhappily. The enotions playing over her face made Evony glance over her shoulder warily as she was quickly unnerved. Her eyes watched Vineda as she reached forward to swipe up an apple from the pile. She cradled it in her hands as she considered how to answer this riddle. Finaly she resigned herself, setting the apple down in her lap. On the back of her notebook page, she doodled a few swirls and the word 'mist'. Then she added her own riddle. tore this sheet from her book and placed it in the center of their cirlce-like formation. THen, keeping her movement as subtle as possible she grabbed her small knife from her boot. After such a tale she had no desire to cause alarm in the company that had apparently accepted her so easily. Her fingers began slicing her apple carefully, glad that no one seemed offended by her method of communication.